Believe it or not, I found this Taurus Model 62 in a local pawn shop in pretty good condition. Metal is in great shape. 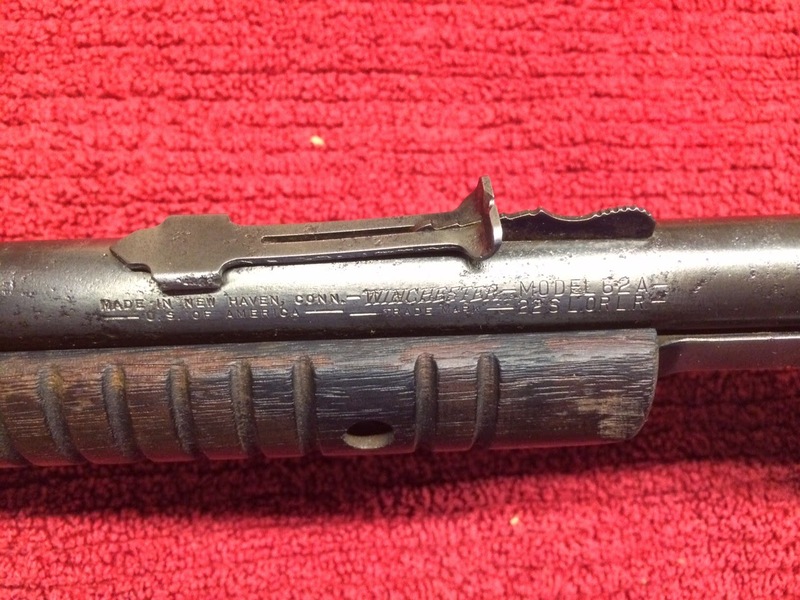 The stock has a couple of dings, though, but given its young age and replica status, I have no quarrel with refinishing the wood myself to make my new plinker a little more presentable. So the first Winchester of the collection is here. A Model 62A in serious need of some TLC. Has pitting on the metal, wood needs work, and the blue is worn down. Will post more pictures as I restore it. I am a collector of "gallery guns." My collection fluctuates as I acquire new rifles, restore them, and sell some of my duplicates. If this is the only post you see, then I just haven't gotten around to posting recent photos of the rifles I've acquired. Check back later, or sign up to be notified when I post new photos. I am a collector of Gallery Guns. If you have a 50+ year old .22 pump action rifle that you are looking to sell, send me a note through the form below.